Daniel Thiriez has revived a French brewing tradition called Brière de Garde. A close translation would be “saved beer”, a farmhouse style quite similar to a Belgian saison- which makes sense given the brewery’s location on the Belgian border. And he makes other wonderful beer styles as well. This label is from a special beer he brewed for a local restaurant. The restaurant is called “2 Sous de Table” which is word play for “dessous de table”, or underneath the table! 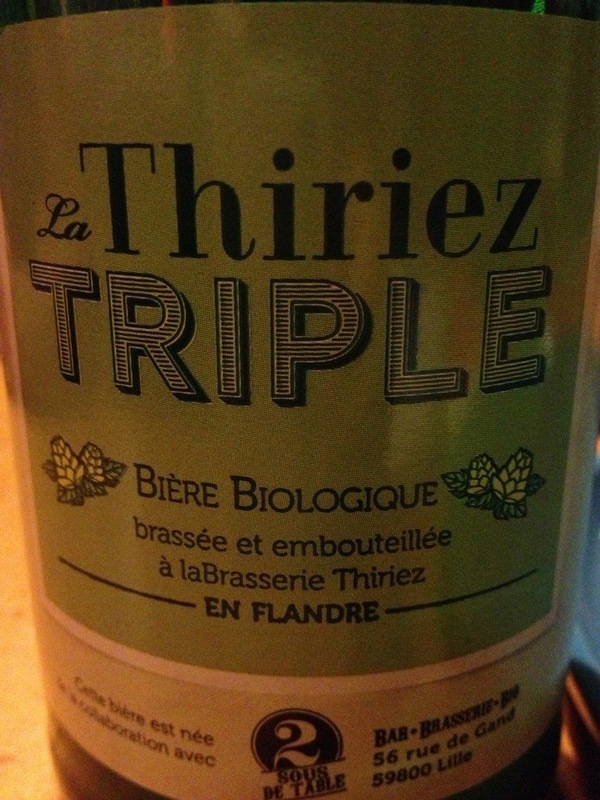 The beer is a Belgian triple with a lovely soft finish- elegant like all of his beers and fantastic with food. The nice about these beers is that they travel particularly well. That are practically made to be bubble-wrapped, packed in a suitcase and shared with friends upon returning home. That’s what I’ve read anyway. Heh heh. Love the word play!